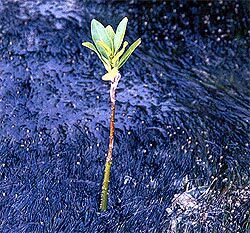 The fruits and seedlings of all mangrove plants can float, which is how they can colonise another area. The seeds float away and lodge in mud, where they begin to grow. Some species will only germinate when temperatures or salt levels are in the right range. Some species do not drop their seeds, but begin to grow out of the base of the fruits to form long spear-shaped stems and roots that grow for one to three years, attached to the parent tree, Once germinated, the seedling grows either within the fruit or out through the fruit.They reach lengths of up to a metre before breaking off the parent plant and falling into the sea. They float horizontally at first then change to float vertically making lodgment in mud much easier. They then begin to grow rapidly. 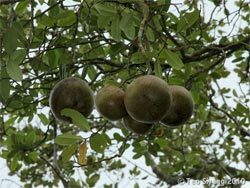 The cannonball mangrove produces a large fruit, about 20cm in diameter containing up to 18 tightly packed seeds. 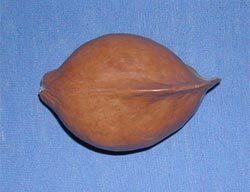 When ripe, it explodes and scatters the seeds, which float away on the sea. 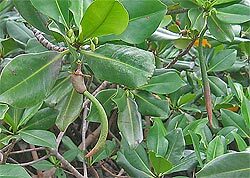 The seed of the looking-glass mangrove has a prominent ridge on one side. This can act as a sail when the seed is in the water. After fertilization, the seedling, does not drop from the tree immediately, but continues to grow in place, reaching about 15cm. in length. When it does drop off, the seedling floats. 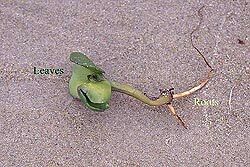 It is heavier at the root end, and eventually the lower end makes contact with soil and begins to grow.